Overall, the Epson Perfection V850 is a great buy. The price can’t be overlooked because it is more expensive than Epson Perfection V800 but its scanning speed, output quality and high resolution make it a good choice for photo keepers and photographers, both professional and amateur. Pros: The Epson Perfection V850 Pro Scanner is a versatile flatbed scanner that can be used by both professional and amateur photographers looking to archive photos, negatives and slides with high quality output. It is capable of scanning images of varying sizes up to 4 x 5 inches if used with the supplied frames and up to 8 x 10 inches without the frames. It can also scan contact prints or sheets. One of the downsides of this flatbed scanner is size. It measures 11.1 x 24.8 x 17.4 inches and can take much of space because of its bulkiness. It also weighs around 15 pounds which can be a setback, especially if it needs to be transported. Also, the price can be hefty for those on budget. 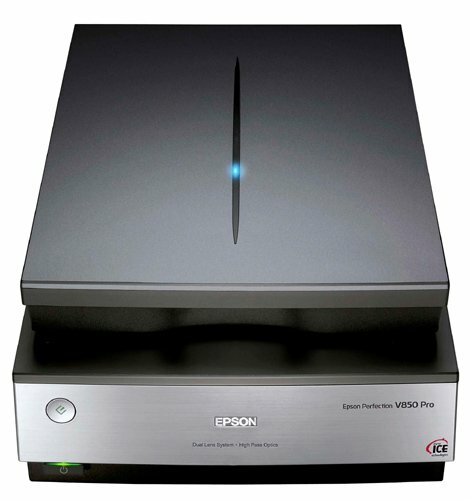 The Epson Perfection V850 Pro Scanner is one of the two flatbed scanners announced by Epson in 2014. The other one was Epson Perfection V800. Ever since digital photography dominated the scene, the use of 35mm films had slightly taken the back seat. This is also one of the reasons behind the popularity of V850’s predecessor, the Epson Perfection V750 Pro and the years it took for the manufacturer to come up with a new model. The V850 is designed for users who want to archive their film files or use their film positives and negatives as well as slides for web applications and printing. This flatbed scanner uses an LED light source, which accounts for its speed and ability to create distinct tonal values, particularly in black and white negatives. It also comes with a variety of frames to hold and accommodate different film and image sizes, including contact sheets. For 35mm films, the frame was designed to make it easier to slide the strip and hold the film steadily using a slip-in clip. The scanner is also equipped with High Pass Optics and Matrix CCD with Micro Lens capable of eliminating color shifts and moiré patterns. The optics has a coating capable of getting rid of reflection and enhancing image quality. The package also comes with the popular hardware/software Digital ICE, capable to remove dust and dirt with the use of a utility that can detect flaws and exclude them at the final image processing. It can be connected to a computer or laptop using the USB 2.0 connection, a feature that allows the user to use older desktops, although USB 3.0 connection would have been a better option. Scanning is impressive at 6400 dpi for film and 4800 dpi for prints. As for controls, the power and start buttons make operating the scanner easier. By just downloading the latest drivers and software from the Epson website, the user can start scanning slides and films. Scanning results depend on the settings and the software use. The scanner comes with the LaserSoft software preloaded with a variety of film profiles. Epson and SilverFast drivers and software as well as X Rite software can also be used, the latter being the perfect choice to scan transparencies. For scanning black and white images, Digital ICE is not as helpful when it comes to solving dust and scratches on the film. However, with other film formats, the user can choose from different options when it comes to balancing density and contrast. Using 3200 dpi brings out the sharpness of black and white scans as well as impressive details in shadow and highlight areas. The 6400 dpi is not as excellent, though. Moreover, with higher dpi settings like 12,800 dpi, scans can appear to have interpolated resolutions. When it comes to speed, using the Epson Scan software takes 15 seconds to scan the images and create a thumbnail for each. Scanning an image usually takes one to two minutes after the image to be scanned is chosen, destination folder has been set and profile and format confirmed. The Canon CanoScan 9000F Mark II and the Epson Perfection V850 Pro Scanner are both compatible with the SilverFast software although it takes around 2 to 3 minutes for the former to scan as opposed to the 1 to 2 minutes needed by Epson V850. The Canon scanner has an optical scan resolution of 9,600 x 9,600 dpi and is lighter than the V850. Both can scan documents and film negatives and slides. This product has one year limited warranty in the U.S. and Canada. For technical support, buyers can contact Epson Technical Support by email or phone. In cases where warranty has expired, there are service centers available. The Epson Perfection V850 Pro Scanner is one of the best and easy to use flatbed scanners in the market today. Unlike other brands and models, the V850 is easier to use with only the power and start buttons to press. Moreover, it promises faster scanning and quality scans for both veteran and amateur photographers. This product is a great buy and is definitely well worth its price.